A new study by researchers at the University of Colorado, ranks the nation’s 50 leading chemistry departments by the percentage of all Ph.D. recipients who are African Americans. Nationwide, Blacks earn about 2 percent of all doctorates awarded in chemistry. 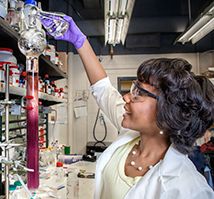 But among the nation’s 50 leading university chemistry departments, Louisiana State University in Baton Rouge leads the way in achieving the highest percentage of African Americans among Ph.D. recipients in chemistry. From 2005 to 2009, 19 percent of all Ph.D.s awarded in chemistry at LSU were earned by African Americans. This was the largest percentage of any of the top 50 university chemistry departments in the country. In fact, Blacks were less than 10 percent of the chemistry Ph.D. recipients at the other 49 leading chemistry departments in the nation. At 10 of the 50 top chemistry departments, there were no African Americans who earned a Ph.D. in the period. Isiah M. Warner, Boyd Professor and the Philip W. West Professor of analytical and environmental chemistry at LSU, reports that when be arrived at the university a little more than 20 years ago, there had been no more than six African Americans who had earned Ph.D.s in chemistry in the entire history of the university. Now there are 30 Black students in the chemistry Ph.D. program every year. The study, “Trends in Ph.D. Productivity and Diversity in the Top-50 Chemistry Departments,” appeared in The Journal of Chemical Education, an official publication of the American Chemical Society. It may be downloaded by clicking here.